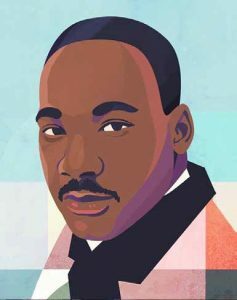 On Monday, January 21, 2019, our nation will remember civil rights leader Dr. Martin Luther King, Jr., with a day in his honor. It couldn’t come at a better time, as this nation deals with extreme polarization and a resurgence of negativity of all kinds, from racism to political apathy. Dr. Martin Luther King, Jr., never held political office, nor was he a mighty businessman. But he accomplished more for our nation with eloquent words than decades of political infighting or millions of dollars have since. He created unity and hope during a time when our nation desperately needed them. While his focus was primarily on eliminating racism, King also pushed for equality among economic sectors of the nation. Many say this is the key issue that dominated last fall’s election, and nationwide, it continues to be obvious in our schools, our court rooms and even our public health centers. Those who come from communities and families with more resources have disproportionate opportunities and quality of life, and there continues to be little action to change that. When you think about it, true equality requires a portion of people to give something up. While it may be true that equality benefits us all, there is deep inertia from many toward the act of true equalization and instead, our nation seems to be moving slowly toward deeper and deeper inequality, especially in our economy. Take education, for example. While it is true that a minimum wage worker’s children can, theoretically, attend college, most can barely afford the cost of co-curricular activities, let alone four years of tuition. To get in, most would have to fight tirelessly for scholarships and loans, and even with a four-year degree, would not be guaranteed a job. Where social barriers have been removed between many races since King’s famous “Dream” speech, economic barriers have been constructed in their place. So how do we reconcile this disparity and move forward? The answer can again be found in King’s belief in the power of hope. 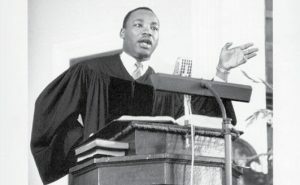 “I see a lot cynicism around and a lot of despair, and it’s understandable despair, and I’ve tried to say to them, ‘Don’t lose hope; don’t give up; picture disappointments and transform them into your own assets and into something creative’,” King told an audience at a Feb. 15, 1968, rally for the campaign. When Oprah Winfrey interviewed Michelle Obama about her experiences as the former First Lady of the United States, throughout the interview, Obama exhibited extraordinary poise and grace as she refused to criticize the incoming president or his supporters. Our nation needs to be behind its leader, she said, and most importantly, it needs to have hope. That does not mean that we go blindly forward without questioning the policies or the actions of our leaders. Instead, Martin Luther King, Jr., preached arming oneself with knowledge and moving forward with determination and perseverance. It is hard to imagine that our nation once allowed outright discrimination against people because of the color of their skin. But in more subtle ways, we continue to discriminate. If Martin Luther King were here today, he would see amazing victories for equality, like a former president with skin the same color as his. But he would also see, surely, the myriad of ways people in our nation continue to suffer from discrimination and inequality and he surely would urge us to take action against those crimes. “Our lives begin to end the day we become silent about things that matter,” King said. Black Thought - Do your shopping habits impede Black business development? Read More About: Martin Luther King Jr.